Outdoor LED lighting has received a lot of press because of it's energy efficiency and extrordinary long life span. LED technology was introduced in 1962 by Nick Holonyak of General Electric who created the first red light emitting diode (LED). 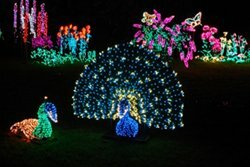 Since then new advancements in technology have allowed for a variety of different colored LED lights, improved lumen output, and longer lasting LEDs to be released. LED lighting is made up of many individual diodes or points of light usually nit closely together to form one large light source. Because they don't use gases or filaments, outdoor LED lighting can withstand substantial vibrations and absorb shock easily. Their high resistance to moisture prevents them from shorting out in places where water would normally accumulate. Although LED lights are very moisture resistant, the electronic circuitry surrounding them is not so resistant. Look for solar LED lights as an alternative to the traditionally hard wired kind. This can save you time and effort if your simply looking for a quick solution to outdoor lighting. LED lights are solid state semiconductor devices that produce light. They are made up of elements such as Boron, Silicon, Germanium, Arsenic, Antimony, Aluminum, Gallium, Indium, Tin, Carbon, Nitrogen, and Phosphorus. When these elements are properly combined and electrical current is passed through them, photons and heat are produced. The LED's core is usually made up of a die or chip which is made up of two semiconductor layers, an n-type and p-type. The n-type layer provides electrons while the p-type layer provides holes for the electrons to fall into. When no current is supplied to the diode, electrons from the n-type layer fill the holes from the p-type layer at the point where the two layers meet called the p-n junction layer. Since all the holes are filled, there are no free electrons or empty holes. When current is supplied accross the p-n junction layer, the n-type layer which is connected to the negative side of the circuit and the p-type layer which is connected to the positive side of the circuit cause electrons to be forced out of their holes and move freely. Current then flows through these open holes in the p-layer causing a side effect of visible light to be released. LEDs are often sold in a package because lighting manufacturers prefer to purchase them this way for easier configuration into their finished product. LED die sizes can vary from tenths of a millimeter to greater than a square millimeter for High-Flux Power Design packages. A lot has changed since the time Nick Holonyak created the first LED light in the red portion of the visible spectrum. Color output has grown to encompass many other colors within the visible spectrum of light. An LED's color is determined by the dominant wavelength of the device. The combination of the elements that the light is made up of will determine the color output. 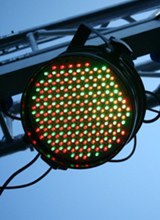 Color mixing is achieved when the colors of three individual LEDs consisting of red, green and blue are mixed to create white light. Cool white LEDs are typically produced by this method. A blue LED is combined with a yellow phosphor resulting in a white light output that resembles that of cool white fluorescent lighting. A single ultra-violet LED is used to excite a tri-color phosphor resulting in the output of a white light. While there is no set life span for LED lights, we do know that they can last significantly longer than incandescent, halogen, or outdoor fluorescent lighting. Outdoor LED lighting lacks components such as filaments, electrodes or ballasts which can malfunction and shorten the life of your outdoor lamp. Light output from LED lights are known to weaken over an extended period of time. This occurs at different times for different LED lights but the effect of lumen depreciation is often excellerated by improper removal of heat from the LED package and maufacturing methods. Keeping the LED die junction temperature below the manufacturer's rated temperature is vital in maintaining an above average life span for your LED lights. Check the manufacturer's specifications for the rated temperature range for proper light function and maximum lifespan. 1) Automotive - LED lighting is currently being used to light car dashboards, instrument panels, tail lights, map lights, and turn signals. Some auto manufacturers have begun using LED headlights. 2) Traffic Lights - Many traffic lights are now using LED lighting because of their ease of visibility and low maintenance. 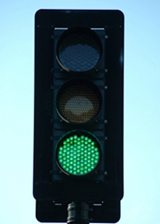 It's much easier to make out the color of an LED traffic light even when being blinded by the sun's glare. 3) Commercial Lighting - Outdoor LED lighting's use in outdoor commercial lighting applications makes perfect sense. Their long lifespan is ideal for installation in hard to reach places while their energy efficiency can help you save tons on electricity costs. 4) Sign lighting -Commonly used as backlighting for smaller luminous letter signs, LED lights stand up to cold temperatures making them a natural choice for outdoor sign lighting. 5) Safety - LED lights used in outdoor step lighting, walkway lighting, and emergency lighting is a good choice because you can easily direct their light output and position. Their small size also makes it easy for you to fit them into tight spaces. 6) Medical Lighting - LED lamps used in medical equipment can emit certain LED wavelengths that can initiate chemical reactions in the body. They can be used to cure dental epoxies, help treat skin cancer and acne. 7) Home Lighting - LED lights are just beginning to be used in the residential home. Backlit house numbers, doorbell lights, and outdoor Christmas lighting are some of the available products made for your home's outdoors. 8) Task Lighting - LED lamps are beginning to show up in the form of flashlights, desk lights, downlighting, and lighting for appliances. Their size makes it easy to incorprate them into your outdoor lighting design. A designer's creativity with outdoor LED lighting is endless. This new lighting technology is still very new to most designers so thinking outside the box can create some really cool and interesting light shows.